Celebrating your birthday at Disney includes special desserts — even for breakfast! Hello everyone! Today is my birthday! I turned 46 years old today — and I realized the other morning that this is the 35th year since my very first trip to Walt Disney World, way back in 1979! Wow, time flies, and so much has changed since that first visit — but one thing remains — Disney Birthdays are as cool now as they have always been! Officially, I have never been to Walt Disney World for my birthday — although, the official Disney policy is that you can celebrate your birthday up to 6 months after your birthday, or you can celebrate your birthday up to 6 months before your birthday — so all of us, if we choose to, could celebrate our birthday no matter when we visit! Celebrating your birthday as a Disney Birthday means wearing a Happy Birthday button — having strangers wish you happy birthday! — having Cast Members wish you a happy birthday — having characters wish you a happy birthday — and, in some cases, even getting special desserts at a restaurant when you eat there! For example, take a look at the special treat that Sophie got when we ate at the Cape May Cafe for her birthday — oh, and by the way, did I mention that we were having breakfast that morning there? In addition to special desserts, you also sometimes get great birthday cards at these restaurants, signed by the characters that came to visit you! How cool is that? 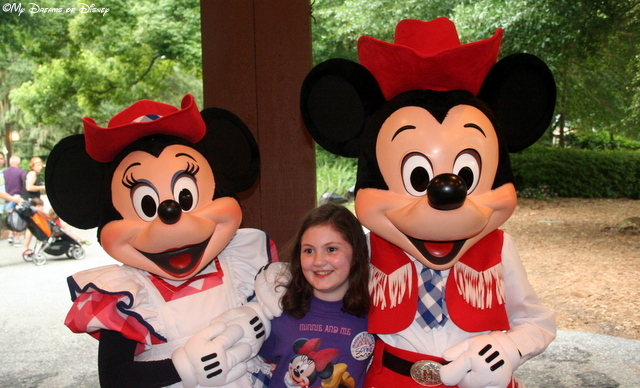 Sophie celebrated her 9th birthday with Mickey & Minnie at Mickey’s Backyard BBQ! 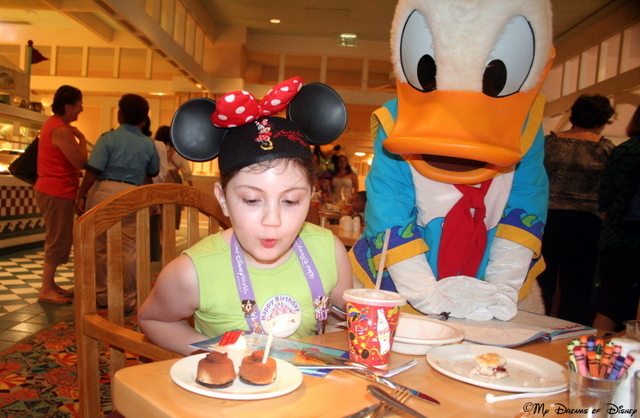 In 2010, Sophie wanted to eat at Mickey’s Backyard BBQ for her birthday, so that’s what we did! Sophie loved seeing Mickey & Minnie all decked out in their western garb, and they both loved seeing Sophie’s new t-shirt that she created with Minnie Mouse! The Birthday Button is the start of a great Disney Birthday! 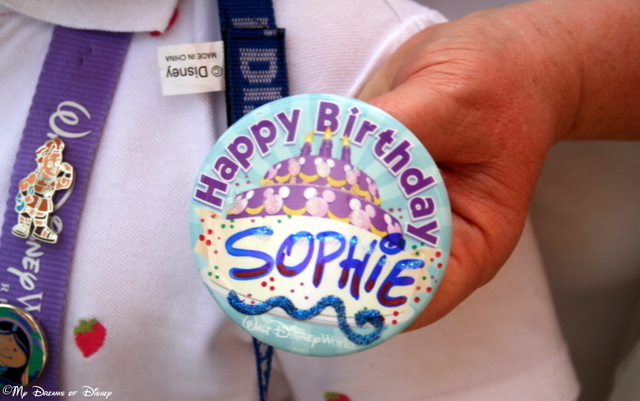 Having your birthday button decorated with your name makes it easy for people to wish you a happy birthday! Sometimes, though, water rides, heat, sweat, and stuff like that can cause your name to wear off — if that happens, see if you can get one of the Disney Animators to redraw it for you — we had this done at Hollywood Studios — the artist just said “here, let’s fix that for you!” — and we still have that button to this day! Sometimes great Cast Members will give you a surprise treat! 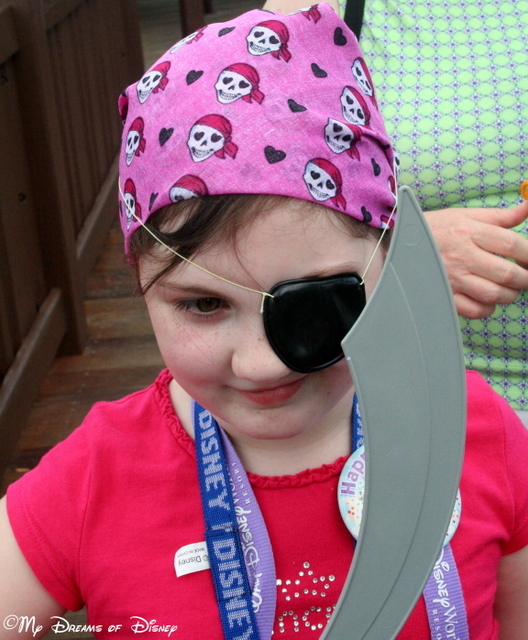 The Pirate bandana — and eye patch and sword in the next picture — were given to Sophie when we rode the water taxi from Port Orleans French Quarter to Downtown Disney. The Pilot noticed Sophie’s button as we were getting off, and he wished her a happy birthday, then said hold on for a moment, went into his locker, and came out with that for Sophie! It was so unexpected, it truly made her day! Sophie sporting the eye patch and sword to go along with her Pirate bandana! 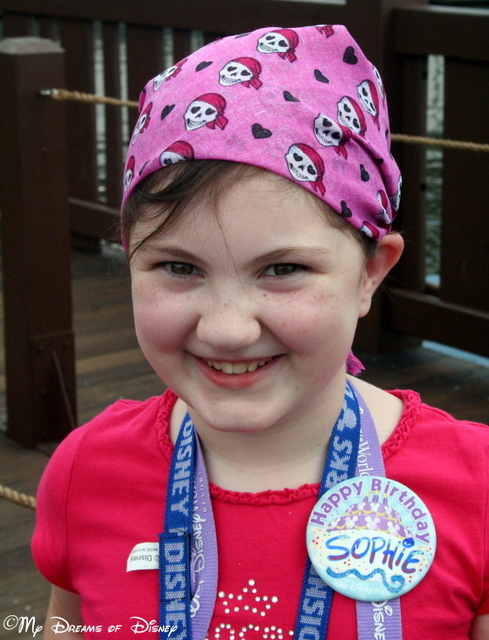 Whether it be a simple ‘Happy Birthday’ from a Cast Member — or total stranger — or something more like the gift Sophie received from the Pilot on the Water Taxi — just the fact of celebrating your birthday as a Disney Birthday truly makes your celebration that much more fun. Thank you for stopping by! How do you celebrate your birthday at Disney — if you have? Let us know in the comments, and remember everyone — go out and make every day a Disney Day!